May is apparently Burger Month, which honestly, isn’t every month burger month? But I figured it was the perfect time to share how I make my “fancy” burgers. Years ago I found several articles that showed how easy it was to make custom burger blends at home, and once I tried it, I was hooked. The advantages to the custom burger mix are: less compressed meat, better texture (less heavy/dense), more flavor, and increased confidence in the quality of the cuts used. My general formula is basically a 2-1-1 with chuck roast as the main meat represented (solid flavor + fat) plus two other lower fat-high flavor cuts. For this time, I used chuck, brisket and ribeye, but I have also used short ribs or flank steak for the smaller cuts. 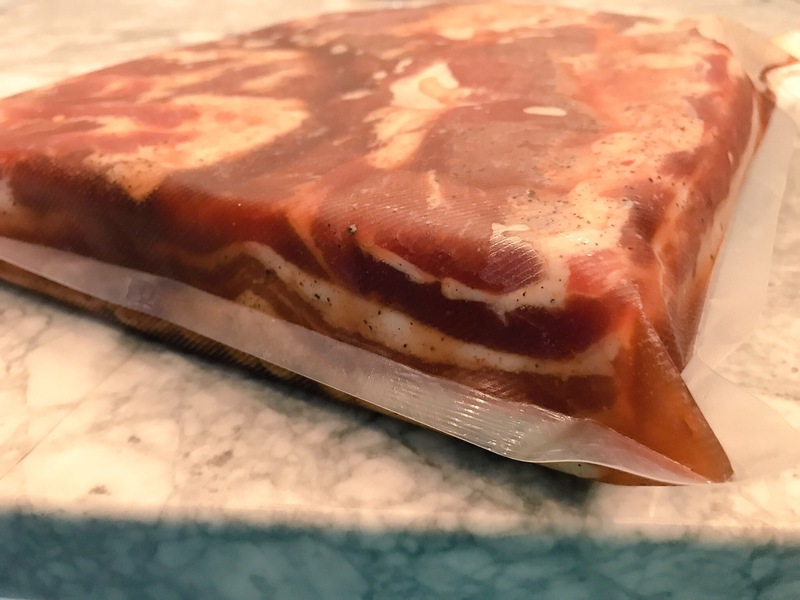 I trim the steaks of gristle and silverskin, cut into roughly 1-1.5 inch cubes, and freeze for at least an half an hour. I keep the cuts separate so I can evenly distribute them in the food processor. You can also add frozen cubes of butter or bacon fat, if you want to bump up the fat content a bit. Then comes the fun part, which is pulsing the meat in batches (with proportional handfuls of each cut) in the food processor for a medium-fine grind. Gently form the patties, you won’t need to indent the top because these don’t constrict as much as store-bought hamburger meat. Salt and pepper the patties generously and refrigerate until ready to cook. I am a fan of charcoal or griddle for cooking these, you can’t go wrong with either method. I would advise cooking medium rare, especially since you have processed them yourself, but they will be juicy even a bit past medium. Add melty cheese, grilled or griddled buttered buns (potato or Publix bakery hamburger buns are amazing) and your favorite condiments and you are ready to go. 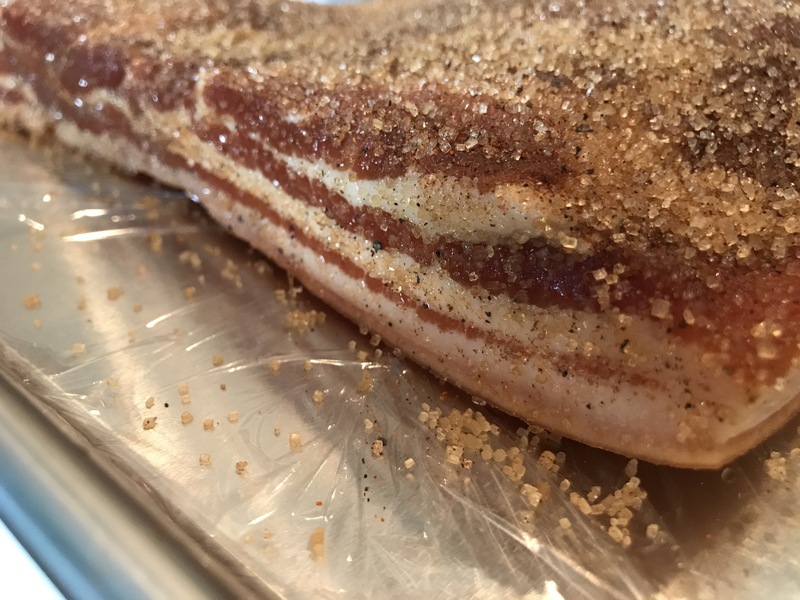 Home cured and smoked bacon is so good, and for someone that loves to learn the nuances of my favorite foods, making bacon from scratch was really fun. For one, it’s easy, with very small amounts of active cooking time. Most is just waiting for the cure to finish and then waiting for it to smoke. For two, it’s delicious – much less wet (for lack of a better word) than store-bought. You also have the flexibility of slicing it as thin or as thick as you want. You will need to get pink nitrate from Amazon, but the rest of the ingredients are simple. I used a combo of the maple bacon recipe Ruhlman’s Charcuterie (pictured below) and the one from AmazingRibs.com . The linked recipe from Ruhlman has a lot more stuff than the book version, but his technique was my home base. For some versions, I used sorghum syrup (similar to molasses) and varied the amount of spice via red pepper flakes and cayenne. The sorghum definitely added a deeper flavor and color, it was a nice variant, but I’m partial to the maple flavor. In the first version I made, I just stuck the belly on the smoker after curing, but it didn’t have enough extra oomph on the outside. 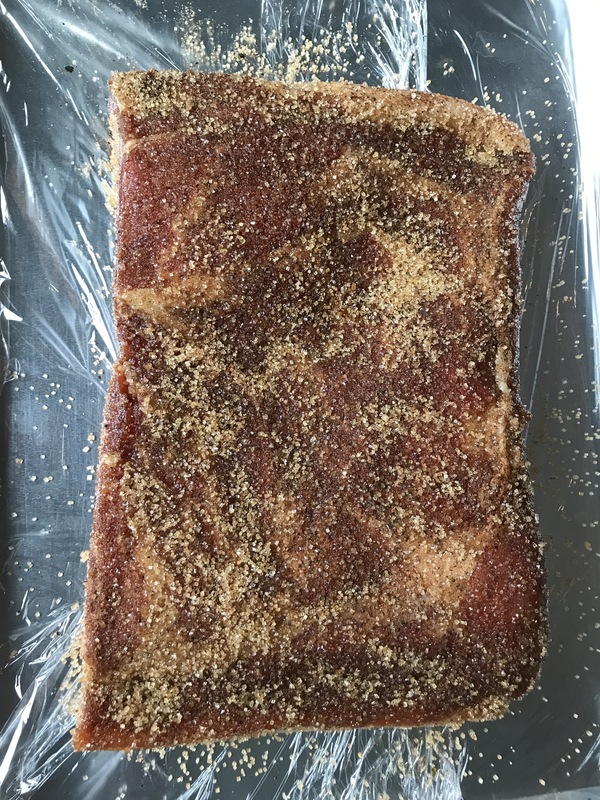 For subsequent versions, I sprinkled raw sugar, cayenne and black pepper on the pork belly before smoking. Then you smoke for three hours at 225 degrees or until the internal temp hits 150 degrees. (I took the skin off after smoking and froze it to use later for greens or soups.) I used applewood chunks for a mild, fruit smoke flavor. Then slice and cook! I recommend baking the sliced bacon so the sugar doesn’t brown too fast, and if you need to crisp it up, you can throw it in a sautè pan at the end to finish it. Tip for slicing: freeze for five or ten minutes before slicing if you would like thinner slices. It’s so good, y’all. And honestly straight-forward to do once you have the ingredients. 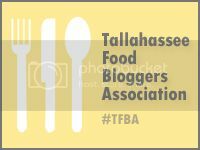 You should be able to get pork belly at your grocery (you may need to request it) or local butcher shop. If not, it can be ordered online. The payoff is worth it.